The slow but stubborn unfolding of justice in a humble magistrate’s court in South Africa continues to embarrass both Rwanda’s President Paul Kagame and South Africa’s Cyril Ramaphosa. It also undermines their intentions to normalise relations between their countries. Last week the Randburg court was meant to start an inquest into the death of Kagame’s estranged former external intelligence chief Patrick Karegeya on New Year’s Eve 2013 in a five-star hotel room in Sandton. But Magistrate Mashiane Mathopa stopped the inquest, agreeing with AfriForum’s Gerrie Nel, the lawyer representing Karegeya’s family, that first the police and the National Prosecuting Authority must demonstrate that they have done all they can to arrest the four Rwandans suspected of murdering him. The suggestion is that for over five years South Africa has been sitting on enough evidence to prosecute the suspects but hasn’t tried to extradite them, to avoid further souring relations with Rwanda. The DPP suggested that was because the suspects had fled to Rwanda because ‘close links exist between the suspects and the current Rwandan government’. There was also no extradition treaty between Rwanda and South Africa and so there was no real chance Rwanda would agree to extradite them to South Africa. ‘It is clear from the above letter that the Prosecution knows who and where the suspects are, and what needs to be done,’ Mathopa said. He issued an order for the investigating office in the case to explain within 14 days what steps, if any, had been taken to arrest the Rwandan suspects, ‘since their whereabouts and their identity are known’. The date of the letter is suggestive, arousing the suspicions of lawyer Nel that there had been ‘political meddling’ in the Karegeya case. AfriForum got involved, he said, because it seemed politics was trumping justice. The DPP wrote his letter just three months after Kagame and Ramaphosa met in Kigali and instructed their foreign ministers to normalise relations. Relations have been going further downhill ever since. Justice it seems, is resisting politics. So Kagame accuses South Africa of harbouring ‘terrorists’ trying to oust him while South Africa accuses Rwanda of sending assassination squads here to eliminate its political opponents. International relations minister Lindiwe Sisulu publicly revealed late last year that she had met Nyamwasa to discuss how he might be affected by the attempts to normalise relations. At the time she also disclosed that she had been ‘pleasantly surprised’ that he was prepared to sit down and negotiate with Kagame. That remark infuriated the Rwandan government which angrily declared it was not prepared to negotiate with ‘terrorists’. Social media trolls believed to be close to the government peppered Sisulu with insults. Normalisation was suspended. The Karegeya inquest is making things worse. It now seems likely that if the police confirm to Magistrate Mathopa that they have not sought to extradite the four Rwandan suspects, they will be asked to do so. If they do, Rwanda will no doubt refuse to hand over the suspects, but in the process, will be forced to field awkward questions from media and others about why it won’t. It’s beginning to look as though South Africa and Rwanda’s interests are inherently incompatible, and not only because of this case. Last week Kagame, acting as current chairperson of the African Union (AU), convened a meeting of presidents of the Southern African Development Community and the International Conference on the Great Lakes Region in Addis Ababa. It included Ramaphosa. Ramaphosa and Namibia’s Hage Geingob seemed to be the only ones opposing these decisions. 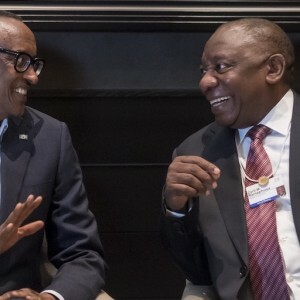 Although Ramaphosa was to be part of the Kinshasa delegation, Pretoria was incensed at what it saw as Kagame railroading the African presidents into interference in the DRC’s legal autonomy. There was plenty of hypocrisy to go around of course. Kagame intervening in the name of democracy? Pretoria upholding the sanctity of the DRC Constitutional Court when it knew that Tshisekedi’s ‘victory’ was just a ploy by ‘outgoing’ President Joseph Kabila to remain the power behind the throne? Then the DRC Constitutional Court confirmed Tshisekedi’s victory on Sunday, thereby pre-empting the visit by Kagame and the other presidents the next day. South Africa and Rwanda could no doubt do many things together on the continent like advancing the African Continental Free Trade Agreement and reforming the AU – if they could only stand each other. But they seem to be inherently incompatible. One thing or another will always erupt to sabotage this reconciliation of irreconcilables.